Do you want to improve your spoken English? You have likely been taking lessons and studying English for a while but still feel like you are a beginner, or even that you sound like one! Is the problem vocabulary? verb tenses? expression? Maybe, but there is something else you might be able to control which won’t require that you improve in any of the areas above. Most of us struggle with involuntary sounds derived from hesitation and nervousness. 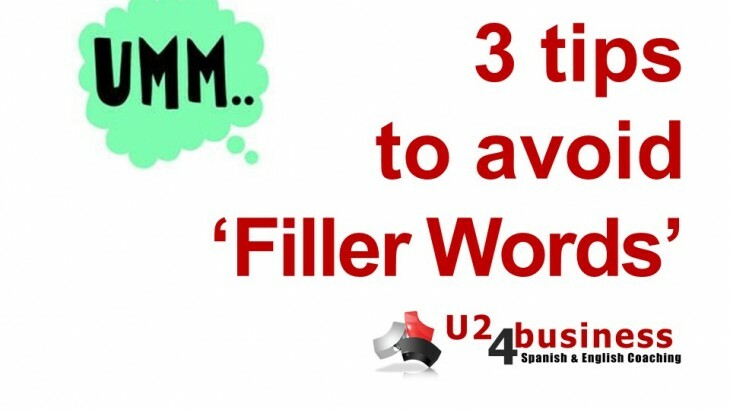 Every time we think before we speak in a foreign language we might be saying things like ‘umm’ or ‘ehm’ which are collectively known as ‘Filler words’. These filler words are common even among fluent speakers, but they manifest themselves in a different form. A fluent or even native speaker may unknowingly use words such as ‘You know’ and ‘like…’ to fill the gaps when talking. Is there anything you can do if you suffer from this crippling verbal disability? Yes. Here are three tips to make you speak amazing business english. There is no shame in speaking a little slower when trying to express a thought in a different language. Just remember, no one is in a rush to end the conversation quickly! Taking a short pause before you open your mouth can have a powerful effect on what you will say. This will also help you in formulating better sentences. Pausing allows you to focus more on word choice rather than on an elaborate explanation, which is something we can be overly concerned about. Far too often, we make a point by going the ‘long way round’ rather than saying whatever we want to say using simple yet effective words. Don’t over complicate things. Just focus on giving clear, short and accurate English thoughts. In time vocabulary and expression will develop naturally. Idioms, U24BUSINESS aprender inglés, aprender inglés rápido, business english, clases de inglés, clases de inglés a empresas, cómo se dice en inglés, formación, idiomas, inglés, inglés de negocios, inglés empresarial, inglés en Granada, inglés en Madrid, inglés en Marbella, inglés en Sevilla, inglés gratis, inglés malaga, inglés online, posts en inglés, U24Business, YouTooForBusiness. permalink. In general I agree with the article. It is important to know how you can use filler words because these must not dissapear completely.